The summer vacations were looming ahead, in the month of may, with the prospect of a whole month of heat and nothing much to do. We had already been to all the nearby places, where one could drive for a holiday, places like Mahabaleshwar, Ganapatiphule, Alibaug, Lonavala, Khandala and even Shirdi. So, where could we go next? 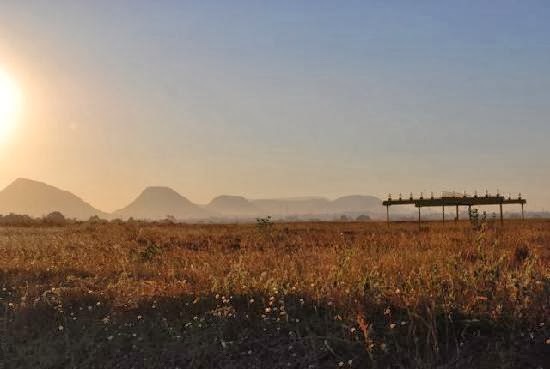 A friend suggested that we try out the Sula Vineyards at Nashik. That sounded pretty interesting since it seemed quite nearby promising a good enjoyable drive and also offering something new that we had never seen before, namely a vineyard. 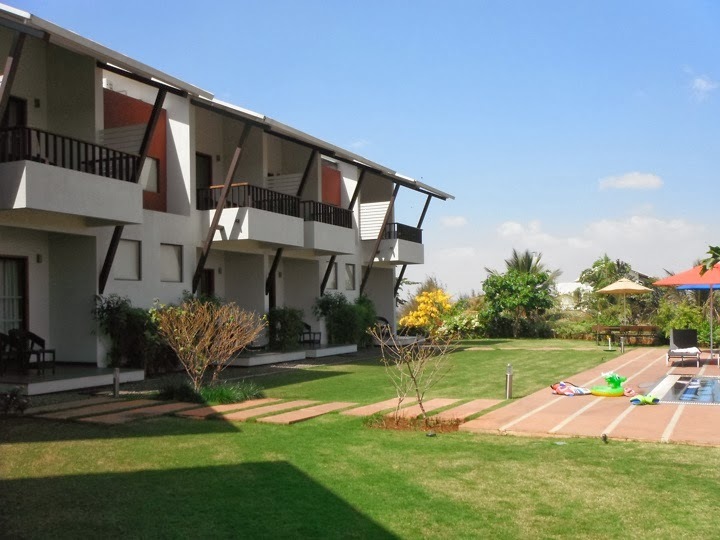 We checked out their website and found out that they have a resort called "Beyond" at the vineyards where one could book rooms or even a three bedroom luxury villa for a comfortable stay. Well, not wasting much time, we went ahead and booked a deluxe room for ourself for two days and two nights. The package included all three meals and coupons for the tour to the Sula Vineyards and bottling factory followed by wine tasting. Sounded good to me! We set off on Monday morning in our car from Thane taking the Nashik highway. The day was fortunately overcast with clouds, therefore making the drive very pleasant and thoroughly enjoyable for us. It didn't take us long to reach our destination, around three hours, inspite of stopping a few times to ask directions. 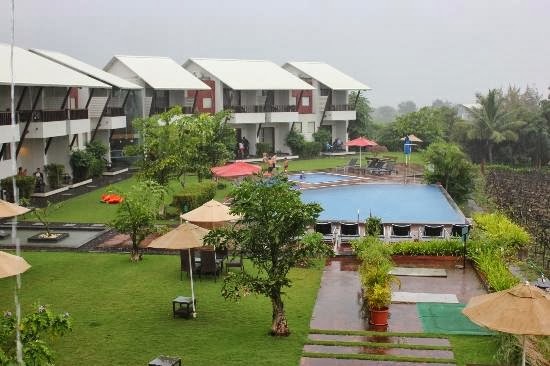 When we reached Beyond Sula Vineyards Resort, I really loved the location and the beauty of the place and the fact that it was isolated from the hustle and bustle of daily life. It looked very peaceful surrounded by the hills, the vineyards in front and a lake closeby. We were given the key to our room, which was situated at one end of the resort on the first floor. The resort had beautiful wine themed rooms, named after diferent varieties of grapes or Sula wines. We were just in time to have lunch at the Cafe Rose. The food was excellent with a good spread and variety for the vegetarians as well as the non-vegetarians. All the three meals that we had there subsequently were also good and worth it. The room was big enough to fit another bed for my son, with an attached bath and a balcony that overlooked the pool and the vineyard at the front of the hotel. The resort looked like a luxury hotel from every angle. They had a game room with a pool table, board games, and lots of reading material that you could take to your room and read at your leisure. They also offered free bicycles that you could take to drive around the hillside nearby or go down to the lakeside, which was not very far off. They also have a gym and a spa facility. Obviously, I could not let the opportunity to use the spa go to waste. I got myself a good back and neck massage along with a footmassage. It was very relaxing and removed all the tensions from the muscles. The view from the balcony was very beautiful, as we could see the lake nestled below the hills in front and the sunset was absolutely breathtaking. There was a good breeze also blowing and so one can sit on the balcony sipping tea, coffee or even wine, that they had kept in the minibar. (of course, these extra items have to be paid for and are not included in the package). In the evening, we took the bicycles and rode down to the lake. Going downhill was easy, but the climb back up to the resort was enough exercise for the leg muscles. Then we headed to the pool room to cool off and play some pool. Had a hearty dinner at night and retired to our rooms for a good sleep. Next morning, we lazed around while I had my massage at the spa and in the evening we went for the tour to the vineyards, which is situated about a kilometer from the resort. 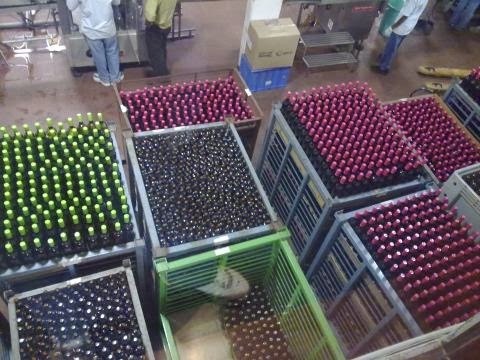 There they have the bottling factory for the Sula wines and also a kind of wine tasting restaurant on the first floor, where you can sit and enjoy the view of the vineyards while sipping on the wines and having some cheese crackers for snacks. We learned a lot about the different types of wines, the different varieties of grapes and how wine is processed and bottled at the factory. It was fascinating. Later we were taken to the tasting room to taste their red and white varieties of wines. We also learned how one should taste wine and to differentiate between the different tastes. (Not that we had to be taught really)! Apart from the factory and the vineyards they also have two restuarants at the place, an Italian and an Indian restuarant. Lttle Italy is a popular Italian restuarant chain that is a Mediterranian-style 50 seater set amongst the estate vineyards offering the visitors a very delightful and unique experience. Or you could visit the Soma, Indian Restuarant situated right next to Lttle Italy, where you can enjoy great food, wine and a warm ambience. The two days and two nights stay was very pleasant and thoroughly enjoyable. Very relaxing and proved to be a good stress buster. The staff was very efficient and hospitable. The rooms were clean and very well ventilated and also beautifully decorated. It almost felt like living in a home away from home. Wouldn't mind going there again and again. Definitely a place that I would recommend as probably one of the best weekend getaways from Mumbai.